PALO ALTO, CA and LAS VEGAS, NV--(Marketwired - August 31, 2015) - At ILTACON 2015 today, Intapp, a global leader in legal software, unveiled Intapp Marketplace -- a showcase of more than 80 solutions built on the Intapp Flow platform. Highlighting solutions developed by seven Intapp services partners, Intapp Marketplace enables customers to connect directly with third-party vendors with the specific expertise they are looking for. Intapp Flow is a workflow application that makes it easy for firms to automate business processes and legal processes. Since its launch last year, Intapp Flow has generated a strong response among law firms as well as in-house legal teams, with organizations with as few as 60 and as many as 6,000 lawyers adopting the application. 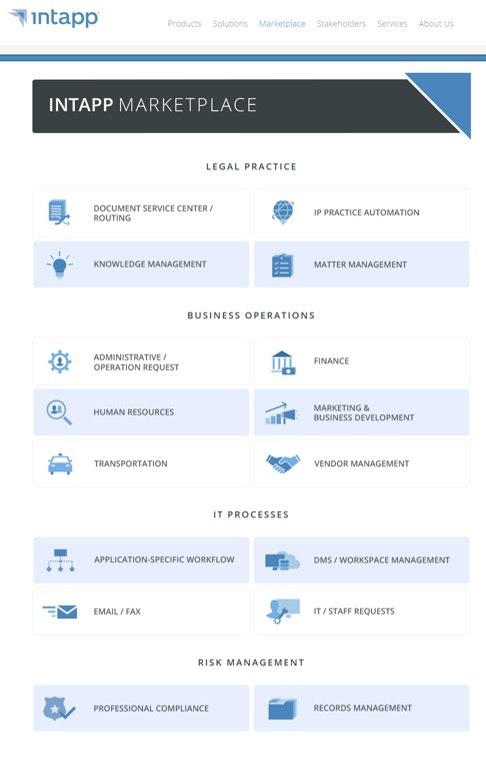 Offering an attractive, modern user interface, Intapp Flow enables rapid development of workflows, and includes Intapp's widely adopted data integration software which makes it easy to connect a diverse range of applications typically used in law firms. "The initial response to Intapp Marketplace has been fantastic. We've enlisted a core group of partners who have been working with law firms for many years and have experience in assessing and addressing the needs of firms across specific areas. Intapp Marketplace allows firms to tap into our partner expertise, and will spark new ideas on how firms can automate business and legal processes across their organizations over time," said Dan Bressler, Vice President of Marketing, Intapp. "We're excited to launch Intapp Marketplace to the legal community, and look forward to fostering a vibrant partner ecosystem that will continue to drive innovation around Intapp Flow." The Intapp partners participating in the initial launch of Intapp Marketplace include Askew Network Solutions, Aurora North Software, Feynbrook, HBR Consulting, Hyperion Global Partners, InOutsource and Pinnacle International Consulting. "I've worked with Intapp technologies for over 12 years, with a deep focus on data management, application integration and process automation," said Jerry Askew, Principal, Askew Network Solutions. "Intapp Marketplace provides a great opportunity for firms interested in improving business efficiency to take advantage of great new resources, including advanced lawyer provisioning, user on-boarding and a variety of Elite 3E solutions we've developed, working with over 80 top firms worldwide." "Over the past ten years, we've built a thriving consulting practice, specifically focused on helping law firms get the most from their Intapp products," said Chris Kave, Founder and Principal, Aurora North Software. "We're proud to join the Intapp Marketplace and offer over a dozen solutions delivering our unique expertise, particularly in legal practice automation." "Intapp Marketplace provides Feynbrook with the opportunity to reach a broad global audience -- and potentially extend our services beyond Australia and New Zealand, where we are best known," said Tony Brooks, Director, Feynbrook. "Our experience and passion for evolutionary products, such as the Intapp suite and NetDocuments, is generating innovative solutions to long-held problems in the legal industry. It's exciting to have the Marketplace to share this excitement." 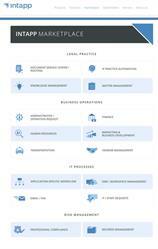 "Intapp Marketplace encourages new thinking about managing workflow and provides examples of how Intapp Flow can help improve processes and business efficiency," said Nicholas Quil, president, HBR Consulting. "As an Intapp partner certified in business strategy, process improvement and technical consulting, we see many opportunities for Intapp Flow to advance operational initiatives in firms of all sizes, including those with complex global structures." "Intapp has delivered significant innovation to the legal industry with Intapp Flow. Intapp Marketplace extends that vision in ways that will accelerate industry adoption and success with the product," said Eyal Iffergan, President and CEO, Hyperion Global Partners. "Hyperion is proud to join Intapp Marketplace and offer several solutions including vendor, finance and HR management workflows." "Intapp has always had a strong track record of successful innovation, and the Marketplace is just the latest example," said Eric Mosca, Director of Operations, InOutsource. "Our focus on risk management across a number of disciplines, including information governance, new business intake, and conflicts management, enables us to offer law firms several risk and compliance solutions, as well as a variety of operational and business process workflows." "We're pleased to offer several solutions that demonstrate our understanding of financial operations, taking advantage of our deep expertise and experience with Elite Enterprise and Elite 3E, as well as our creativity and ingenuity with external applications," said Christopher Young, Lead, New Business Intake and Risk Management Team, Pinnacle. "Intapp Flow offers law firms tremendous opportunity to simplify, scale and streamline business operations, and we're delighted to expand our collaboration with the Intapp community via Intapp Marketplace." Intapp provides software that enables law firms and other professional services firms to thrive in an increasingly competitive marketplace by improving operational efficiency and driving client success. Intapp's three practice groups (Revenue, Risk and Integration) focus on understanding existing pressures and emerging trends, and translate this knowledge into products and best practices. Intapp products allow firms to align business operations with business strategy, and are recognized as the most advanced in their respective categories -- time entry and recording, application integration, information security, new business intake, and conflicts management.